Here is what we are starting with this front cap was taken out, prepped and dyed color to match the new headliner being installed. We no longer vinyl cover this cap (too hard and will not last long term, time has proven this). Looks fine right? Look closer and you will see the crack that we need to make go away. 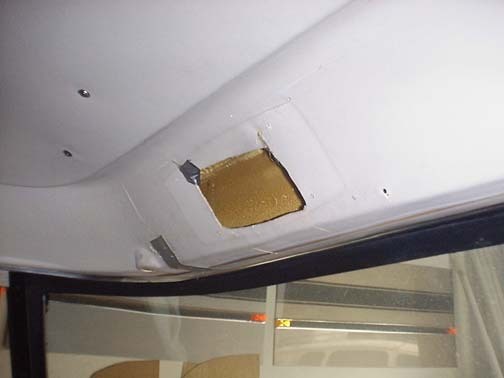 This ABS plastic panel has become brittle over the years and it is not uncommon at all to see cracks in many places. This is how I “repair” a crack in this area. Well, repair is not the right term. Here is the trick—- most people will try and glue or weld this back together– it never finishes off good. I mean, it always leaves a scar, the original finish is textured and there is no way to duplicate that surface— so don’t try! No, what you want to do is find a natural looking way to cover that area. Stretching vinyl or anything else stresses the material too much and if you actually do get the material to stick in place (I have tried many ways and most leave me short) ot will not stay there long term– there are just too many bends. So, what to do– here you go. Pattern and cut insert panels that tuck into the flat , cover them with a color keyed vinyl (you could also use a contrast color but we are going for a clean uniform look with this one) and rivet them over the crack. , I make these inserts in 2 sections because of the stress shaping them into position. 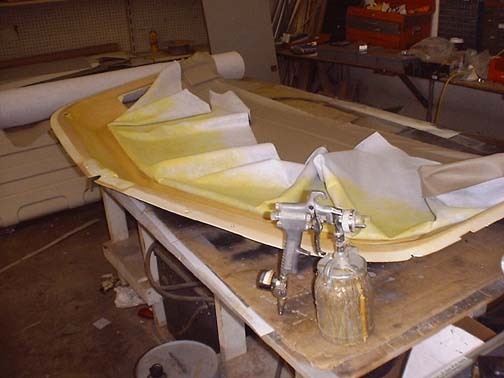 To make the bend neat the visor mounts, I belt sand one layer of ply to make the panel more bendable (another good trick). Now remember where the crack was, it was actually in the center of the cap– go back and look at the pic of that— Before riveting in the 2 panels, I inserted a folded vinyl cover strip over the center area to cover the crack totally , sounds like a lot of work but the 2 panels are actually there to cover the edges of that small section of cover vinyl. 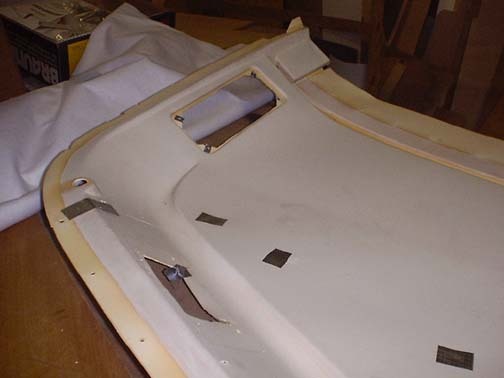 The end look is clean and not repaired, the panels highlight the cap and does not look like a repair– — and that my friend is the whole point– make it look new.